the Daniel Defense V7 is the first rifle in the DDM4 lineup to feature the M-LOK® attachment technology with the Daniel Defense MFR 15.0 rail. Built around a Cold Hammer Forged, 16” barrel, the V7 has a DD improved Flash Suppressor to reduce flash signature. The Daniel Defense DDM4V7S is our latest short-barreled rifle (SBR) to feature the M-LOK® attachment technology with the Daniel Defense MFR 10.0 rail. KeyMod is a recoil resistant, two-part, direct attachment method for accessories that offers outstanding “return-to-zero” when accessories are removed and reinstalled. The DDM4V11 LW is equipped with a free-floating, Cold Hammer Forged, 16” Lightweight profile barrel, making it almost 5 ounces lighter than the standard V11. 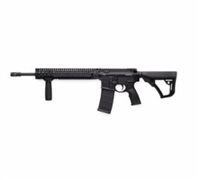 This rifle also includes the newly designed, rugged and comfortable Daniel Defense Buttstock and Pistol grip. DANIEL DEFENSE DDM4 V9 CARBINE - S2W PROFILE. The new Daniel Defense DDM4v9 Lightweight is designed to satisfy the needs of modern shooters not only in popular shooting sports but also for tactical and defensive applications. The Daniel Defense MK18 Pistol is a variation of the MK18 SBR which has been extremely popular within the Law Enforcement and Special Operations communities. M4 CARB MK18 556NATO 10.3"
The Daniel Defense MK18 Pistol, equipped with the SB-Tactical SOB Pistol Stabilizing Brace, is a variation of the MK18 SBR, which has been extremely popular within the Law Enforcement and Special Operations communities. The MK18 Factory SBR by Daniel Defense is unmatched in size, weight, and performance. This rifle also comes with the newly designed, rugged and comfortable Daniel Defense Buttstock and Pistol Grip. The rifle is finished off with the rugged and comfortable Daniel Defense Buttstock and Pistol grip. This rifle is finished in Daniel Defense Tornado Cerakote. The Daniel Defense V7 is the first rifle in the DDM4 lineup to feature the M-LOK® attachment technology with the Daniel Defense MFR 15.0 rail. The Daniel Defense M4 Carbine V11, based on the popular V9 series, was designed for shooters who prefer the benefits of the KeyMod system integrated in the new SLiM Rail. The DDM4V1, the original Daniel Defense Rifle, is built with a Cold Hammer Forged 16” M4 Profile barrel with a Carbine gas system. It comes installed with our proprietary front sight base which is precision CNC machined from a solid billet of 4140 steel. DANIEL DEFENSE DDM4 V1 16"
The Daniel Defense M4A1 features the M4A1 RIS II, which has been in use by US Special Operations Command (SOCOM) for the SOPMOD II Weapons System since 2005. A free-floating SLiM Rail 12.0 handguard offers incredible weight savings as well as superior cooling, ergonomics, and modularity while maintaining the strength and durability expected from Daniel Defense. DANIEL DEFENSE M4V11 PRO 18"
This highly maneuverable pistol pairs a 10.3” barrel and the MFR 9.0 rail for fast handling, accuracy, and reliability while also providing compatibility with a wide variety of muzzle devices and sound suppressors for even more customization. the Daniel Defense MK18 features the railed forend Daniel Defense currently provides to USSOCOM and a 10.3” Cold Hammer Forged Barrel. The MK18 rail system features the Bolt-Up System has been rigorously tested prior to fielding by USSOCOM (currently over 15,000 units).